The SmartLF Gx+ 42’s white LED illumination produces high quality color, just like fluorescent illumination. However, because LEDs operate with a stable light spectrum from switch on (cold) through hours of use (warm), you do not have to wait for them to warm up before you can use the scanner to best effect. Simply turn it on and scan! While you would normally expect to replace fluorescent tubes every year or two, LEDs are long life. Unlike fluorescent tubes, which stay on the whole time the scanner is switched on, LEDs only come on during the actual scanning process. They have an estimated working life of 50,000 hours which equates to over six years of constant 24/7 scanning! IAT allows you to create better quality scans of dirty documents more quickly. 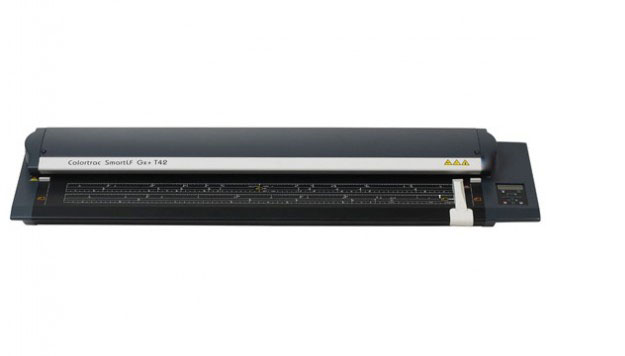 The free SmartWorks EZ Touch software supplied with the SmartLF Gx+ 42 wide format scanner has three IAT settings; SmartWorks Pro software (not included with the scanner) has comprehensive IAT that you can set in real time using slider bars. SmartLF Gx+ 42 Advanced Active Paper Transport protects your documents. The SmartLF Gx+ 42’s Advanced Active Paper Transport (APT) applies the minimum force necessary for preserving delicate originals, while achieving the required traction and accuracy to ensure images are sharp and shadow free. The supplied SmartWorks EZ Touch software is designed for operation by non-specialist users and is very simple to use while providing all the basic scan to file and scan to copy functionality you need. The SmartLF Gx+ 42 requires minimal service and calibration. The utility software included with it provides you with all the maintenance applications you need to keep your large format scanner in prime condition and up-to-date with the latest firmware and drivers. The scan glass is held down by magnets for quick and easy removal or replacement and there is easy access to the SmartLF Gx+ 42’s paper feed for cleaning. You can upgrade your scanner quickly and easily, by email. There is no need for you to return the scanner to us or for a service engineer to call.